As part of the British Military Police during WWII, Joyce watched as London burned through German bombing raids, soldiers kissed their families goodbye, and children huddled underground. The electrical lines wind off into the distance. Footsteps and soft murmurs echo through the tunnel as mothers come forward, cradling cardboard boxes. Inside the boxes, swaddled in blankets, is one of the only things they were able to bring with them. Gently, they lower the babies onto the dead electric lines, where they will spend the night safe from the German bombs raining down on the surface. “That’s what I saw when I was down there, was all these little babies. They were all sort of quite cozy, but worried about what was happening up above. That was one of my happy memories,” said Joyce Schmalz, who served in the Royal British Army as a Military Police. Joyce was born in Hounslow, England, in 1921. Her father died when he was only 42 as a result of WWI, leaving her mother to raise Joyce and her three older siblings on her own. Despite the lack of money, Joyce went on to attend university. At 21 she was unsure of which major she wanted to take, though she knew she loved writing. The decision was proved moot, however, when the university closed because of the German bombings and blackouts of WWII. Joyce felt very strongly that she “could not sponge off” her mother. However, she also didn’t have any job-related training, only schooling. 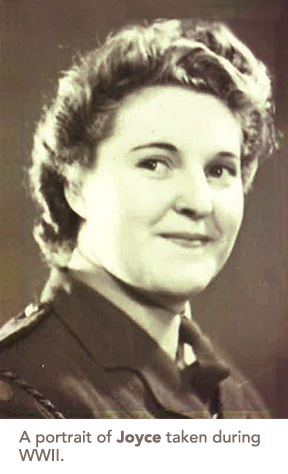 Joyce joined the British army in 1942, at the age of 21, her red cap making her stand out as a Military Police. Joyce spent some time around Piccadilly Circus, looking after the families that took refuge from the bombs in the subway tunnels. She’d spend the night keeping an eye on them and making sure no one needed anything. She also helped source cardboard boxes to work as makeshift cribs, which held infants through the night. “They were safe, but it was a terrifying place and a terrifying thing to do, because the adults were so worried about not knowing what was happening to their house with the bombers coming all the time. So it was really terrible, but when I see these little children, little toddlers, they were a little later going to bed and they’d play and we’d sing nursery rhymes,” Joyce said. She can still remember the sounds the bombs made as they came over the city, and the worst was the Doodlebug. It was an early cruise missile that used a pulsejet for power. It made a sound like a pulsating air horn as it flew overhead, but it wasn’t the sound you had to worry about. Around 1943, Joyce was stationed at the Waterloo train station in England. It was one of the first stops for many British and American soldiers going overseas. At night, the platform would be filled with soldiers and their families who had come to say goodbye. “They were taking a chance that perhaps it was tonight they would leave. They never knew,” Joyce said, explaining that the station was a huge target for the Germans. No one knew when the train would come, nor where it would take its passengers. “I was always amazed about how everybody could… they did so well at trying to appear cheerful and not upset, and they would talk to each other and tell jokes or sing. I couldn’t believe how they could be so cheerful knowing that they were going out somewhere and never knowing if they were coming back,” Joyce said. One particular night stands out for Joyce more than the others. She joined a fellow Red Cap at Waterloo Station and waited with him for his train. He was a paratrooper, the first in and the last out, responsible for being the first to jump and make sure the way was clear for all who followed. He was also Joyce’s unofficial fiancé, the two having plans to marry after the war was over. Joyce never saw him again, and to this day she doesn’t know what happened to him. That was in 1943, a time when the fighting in Italy was quite vicious. After the liberation of Paris, France, in August 1944, Joyce was stationed in the London District to help transport German nurses back to Germany. “They were protected personnel; they were not prisoners of war. We looked after them, which is something like rescue them because the French would have killed them,” Joyce said, explaining that the fighting within German-occupied France had bred a lot of hate. She helped look after the nurses for seven weeks while they waited for a neutral boat from Sweden to come and deliver them to Germany. It was not an easy time, and tensions ran high, but the weeks passed and the boat came. Joyce accompanied them to Liverpool, England, where she and the other British personnel disembarked before the boat continued on its journey. The war ended on September 2, 1945. Seventy-two years later, Joyce is well-known in her community for her seniors advocacy work, which she hopes to spread from Surrey to Port Coquitlam, BC. She currently lives at Mayfair Terrace Retirement Residence, and has two great-grandchildren, who are set to start French immersion. This is something Joyce is looking forward to, as she has not been able to practice her French in a while.